Scooper - Technology News: From greenhouse gas to gasoline: is this the future of fuel? From greenhouse gas to gasoline: is this the future of fuel? The porous material can be made by depositing tiny polystyrene beads on a conductive electrode substrate, then electrodepositing silver on the surface, then dissolving away the beads, leaving pores whose size is determined by that of the original beads. Because of the way spheres naturally organize themselves when packed together, this method produces a honeycomb-like structure of hexagonal cells, Surendranath explains. It turns out that varying the thickness of this porous catalyst produces a double effect: As the porous inverse opal get thicker, the catalyst more strongly promotes the production of CO from CO2 by up to three times, while also suppressing an alternative reaction, the production of H2 (hydrogen gas), by as much as tenfold. Using this combined effect, production of CO can be easily varied to make up anywhere from 5 to 85 percent of the reaction’s output. The study’s results provide fundamental insights that may be applicable to designing other catalyst materials for fuel production from CO2. 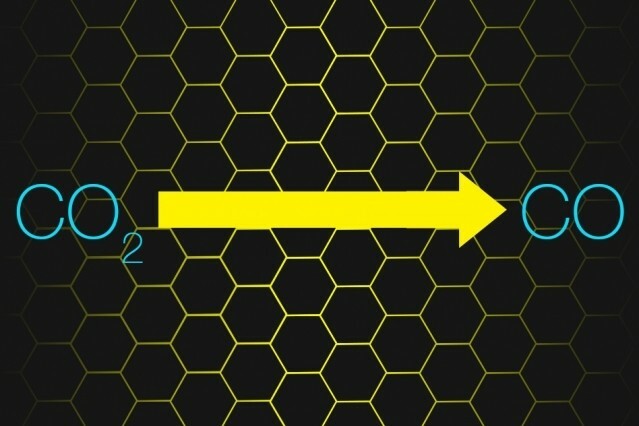 This advance represents just one step in the conversion of carbon dioxide into usable fuels, and the initial demonstration is just at a small laboratory scale. So, much work still remains for this to become a practical approach to manufacturing transportation fuels. But because the selectivity and efficiency of this initial conversion step places an upper limit on the overall efficiency of fuel production from CO2, in technical terms, Surendranath says, the work provides key fundamental insight into how to engineer carbon-neutral technologies for replacing existing fossil-fuel systems — while still being able to use all of the existing infrastructure of gas stations, delivery vehicles, and storage tanks.